Intel revealed that the end of the road for Silicon is nearing as alternative materials will be required for the 7nm node and beyond. This is perhaps one of the more interesting stories that came out of this year’s international solid state conference. It has been well known that Silicon is running out of steam but it was previously believed that Silicon would make it at least to 7nm. Intel however believes that Silicon alternatives will be required for the 7nm process and beyond. Moore’s law which is the observation that transistor density doubles every year, later amended to every couple of years, has slowed down dramatically in the past few years. Scaling Silicon transistors down has become increasingly difficult and expensive and at around 7nm it will prove to be downright impossible. Digital computing which is what the entire world has relied on for the past several decades is based on one basic concept, on or off. The zeroes and ones in binary simply indicate if a signal is present or not. The fundamental flaw with Silicon transistors is that at the 7nm point the transistors sit so close to each other that an effect called quantum tunneling occurs. This effect unfortunately means that the transistor cannot reliably be turned off and for the most part will stay on. What this means is that your binary code is not binary any more because it’s all made up of ones and no zeroes. Which in turn breaks the fundamental rule of digital computing. So the physical limitations of Silicon are very real and in fact insurmountable. One alternative is to find a material which can physically scale down past Silicon or can achieve faster switching speeds. The other is to rely on something other than electricity to achieve/read on or off states such as light. The first option is more straight forward. Which is why the semiconductor industry has been researching alternative materials that are not only capable of scaling down past Silicon but can also be manufactured using similar techniques. There are dozens of different Silicon alternatives out there. Unfortunately each one has one or more significant challenges ahead of it. However there’s one very promising short-term Silicon alternative that will most likely supersede Silicon for a few years. It’s a III-V semiconductor based on two compounds and four different elements. 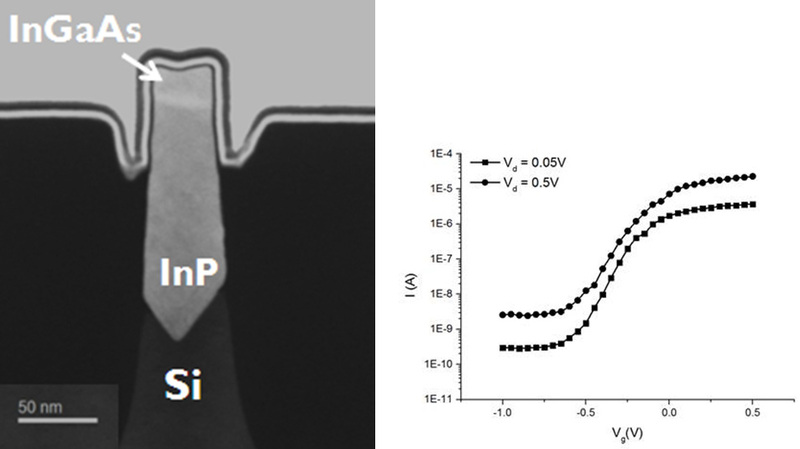 Indium gallium arsenide ( InGaAs ) and indium phosphide (InP). Imec, a research center tasked with finding the next thing after silicon, has already managed to fabricate FinFET transistors using InGaAs and InP on a 300mm 22nm Silicon wafer a year and a half ago. Imec is funded by Intel, IBM, TSMC, Samsung, Hynix and every other major semiconductor player with a fab that you can think of. Fortunately this silicon alternative doesn’t have any major physical flaw like most other materials. Silicene and Germanene for example degrade within a few minutes or hours while Graphene isn’t suitable for all transistor types and is still extremely challenging to use in the production of integrated circuits due to the fragility of its structure. InGaAs and InP based devices can be manufactured using existing techniques in combination with Silicon. The main issue remains to be yield and cost. But if we’ve learned anything about the semiconductor industry is that people will always find a way to improve yield and reduce cost eventually. The “next” thing after Silicon is still very much unknown. What is for certain is that we’ll have to figure out what that “next” thing is fairly soon.